A claw toe is a toe deformity from both the middle and end joints in the toe being contracted. The toe deformity can often lead to “digging” into the sole of a shoe or into the floor which can be painful. Over time the joint lining can become thickened and scarred. In order to relieve pain and help with the deformity, a release of the joint lining can be done for mild/moderate claw toe deformities. Reasons to avoid surgery include active infection, poor circulation to the toes, and any serious illness that would make surgery unsafe. An incision is made over the top of the foot at the base of the toe. Additional procedures that may be needed to correct the claw toe can also be performed if needed. The thickened top part of the MTP joint capsule is visualized and then cut (released). The joint capsule, both on the inside (medial) and the outside (lateral) are also often cut to allow the toe to have a better position. It may be necessary to stabilize the toe with a pin across the joint. This would be particularly necessary if the joint had been partially out of position prior to the surgery. This will often occur in patients with severe clawtoe deformities. Recovery from the surgery is often dictated by the associated procedures that were required to correct the clawtoe. The actual recovery from this surgery is relatively quick and movement can be started once the incision has healed, after 10-14 days. If a pin was used, it is typically removed at 4-6 weeks after surgery, and motion exercises are started after the pin is removed. 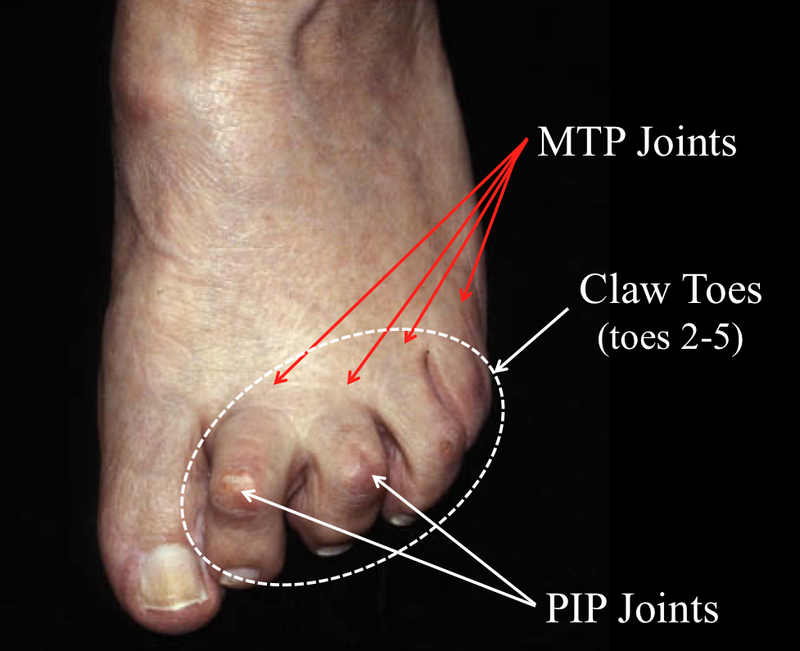 There are often other procedures such as a PIP joint fusion or a tendon transfer procedure that will limit mobility of the toe for the first 6 weeks. Scarring at the base of the toe can lead to stiffness. Recurrence of the Deformity. If new scarring of the joint capsule occurs, the deformity can occur.